One thing I'd intended to do with this blog that I haven't yet begun was to talk about exciting and inspiring projects and ideas being put out there by other smiths, craftspeople, and artists that I feel both kinship and creative difference with. I'll try to talk about why I think their work, ideas, and the questions they raise are important for me and how I would like my work to reflect my influences and give credit where it is due. I'm also just really happy to share the work of talented and passionate individuals, for the amount of inspiration and excitement I get from others is incredibly awesome. So basically, I'm going to announce some stuff about other people's projects and provide links and pictures (with permission). I'll probably talk about my perception of their work overall, hopefully without pigeonholing them, but their voices are strong, and I just wanna get the word out. Here we go! The first project that's been on my mind lately and has made me whistle and say "awww yeaaah" is this excellent Merovingian langsax collaboration between none other than the Michigan iron-smelting maniac Zeb Deming and the Wisconsin blade wizard Scott Roush! Zeb gazing adoringly at his iron smelting stack. First the smiths: Zeb Deming is a daring, patient, and talented ironmaker who has taught himself well the methods of bloomery smelting (producing iron from iron ore) and hearth melting (melting iron in a small furnace to carburize/decarburize it at will). 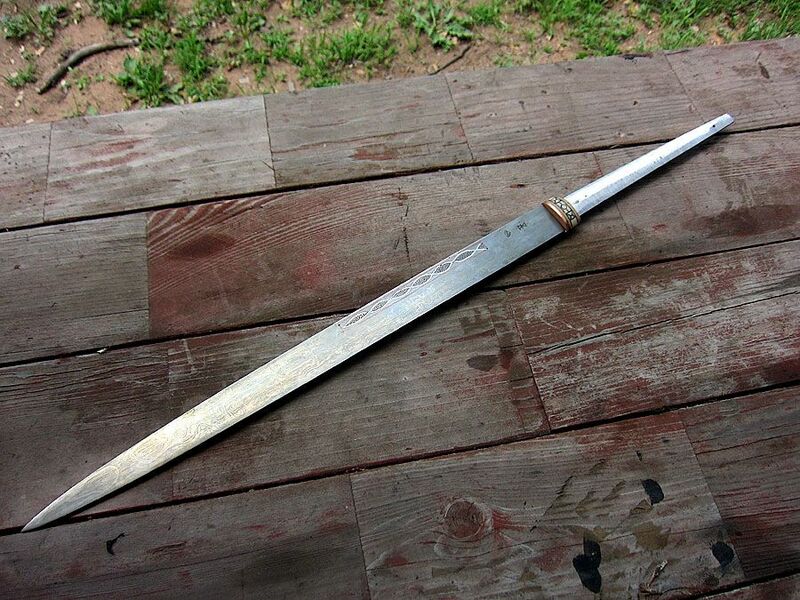 He is also a proficient bladesmith and pattern-welder who has drawn attention to himself though the use of unusual and exciting steels and irons, such as his own bloom steel, hearth steel, and meteoric iron. Not only do these materials lend his work an indisputable authenticity in fact and in feel, they give his pieces infinite uniqueness, a deeply-imprinted sole-authorship (see this post by Myles Mulkey) and intrinsic story (see this one by me). He's also an incredibly nice gentleman; "Michigan maniac" only works because of the alliteration. Scott with his interpretation of a Norwegian langsax. 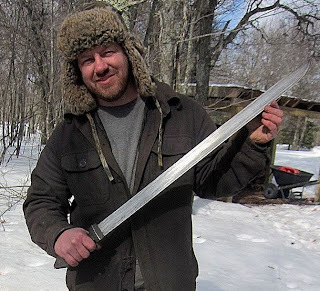 Scott Roush, one of the preeminent swordsmiths of the American Midwest, has a style. Anyone who's seen two of his pieces gets it and won't forget: stark, bold contrasting blade steels; dark, earthy handles with a visceral feel of hand-made and well-used. From the get-go, he made a deep impression with clever and skilled manipulation of texture and finish. 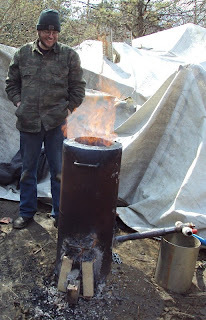 Recently, he has been breaking new and fascinating ground for himself like a wild man, fearlessly exploring techniques with impressive degrees of success: smelting, wire inlay, carving, and (particularly) casting. I might add that his blade photography is top notch (considering his already impressive career as a photographer). I've never met him, but I can say that he's an encouraging presence in the scene and a deeply inspiring fellow! 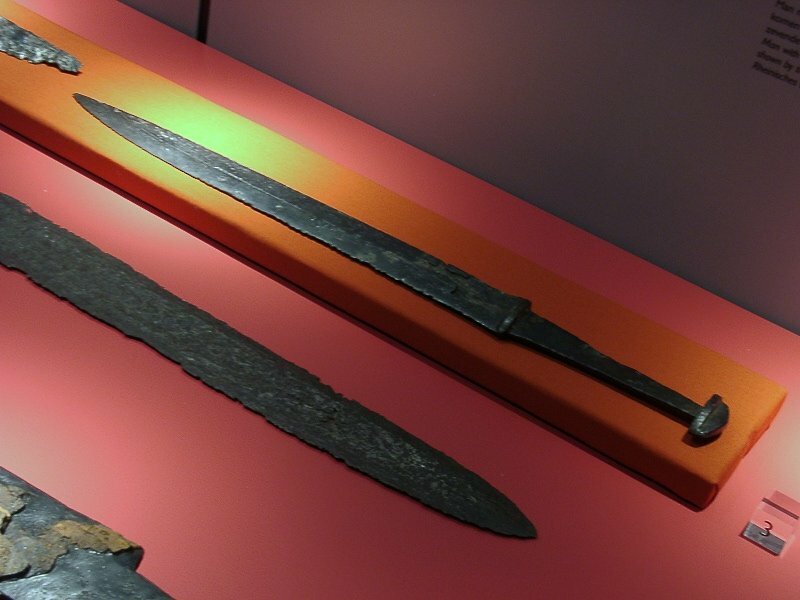 Now the inspiration: Scott cited the langsax to the left, which is attributed to the Merovignian-era Franks, as the major model for the collaboration, at least as far as blade dimensions, profile, and fittings. Materials, decoration, and organic fittings were more or less up in the air, and I can honestly say I'm proud of what they're doing with this freedom. has never been made, and no one will ever make steel exactly the same as Zeb's; it's truly as creative a process as the blademaking, but making one's own materials is different than making a piece or even the tools to make a piece. It's like mixing your own paint from plants; not only are you connecting hands with centuries of people through a material: your hand is occupying the same space, moving with them, learning with them. Zeb put a piece of his soul in this steel to merge with that of everyone who's ever done the same thing and gained the same knowledge that he has. 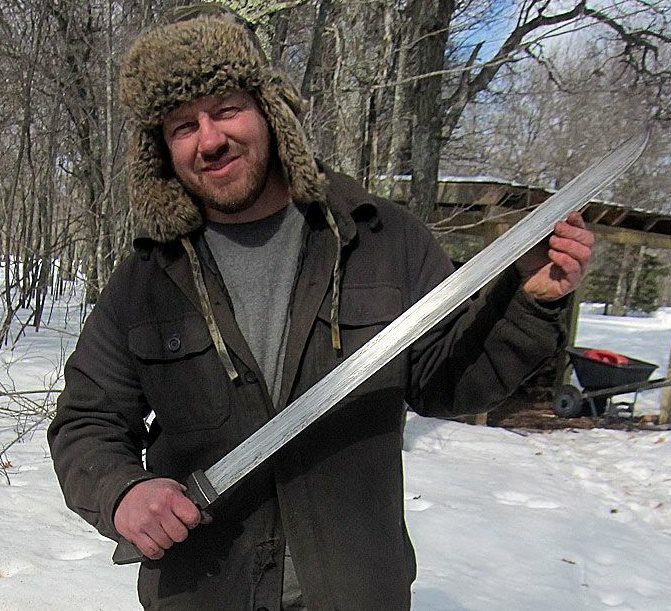 Scott has taken it upon himself, in finishing this blade, to bring it to a serious next level of existence. I have already mentioned Scott's strong and flavorful sense of texture and finish-feel, but I can see that in this blade he is stepping beyond his already palpable style and integrating totally badass technique in a really tasteful and awesome way. The inlay, first of all, is nothing outrageous or glaringly inauthentic, which seems to follow so often on the heels of skill acquisition. The pattern clearly does not overstep the feel of the piece, which is a difficult thing to gauge accurately. Next, it is clean and very well executed, and I really look forward to see Scott's development and use of this technique! 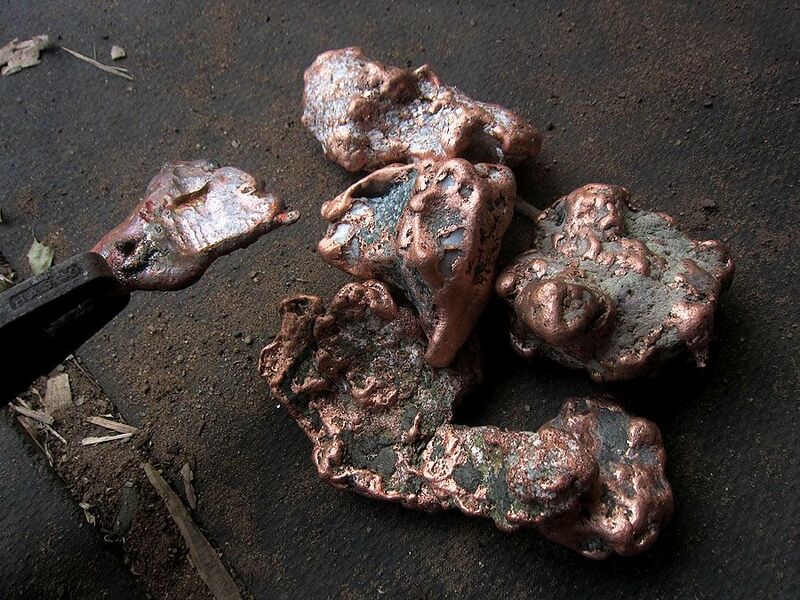 I'm a big fan of choice of materials for this sax, particularly in Scott's use of local native copper (below). Copper is, to my knowledge, the only metal that occurs naturally in usable quantities, and the fact that he found and is applying this material as it would have been in ancient days is awesome. Another interesting element of this piece that shakes the imagination is the inlaid copper element that Scott has cryptically referred to as the 'ellefen head'. Clearly it's supposed to represent some sort of otherworldly being without any real explanation of who that is or why it's there; however, the mystery of the thing really adds something to the character of the piece for me. Scott fearlessly adds storytelling (or story-facilitating) elements to his pieces, and I appreciate it. For more information on the concept of otherworldly visages in period art, see Petr Florianek's post on what he calls the "fierce face" motif. 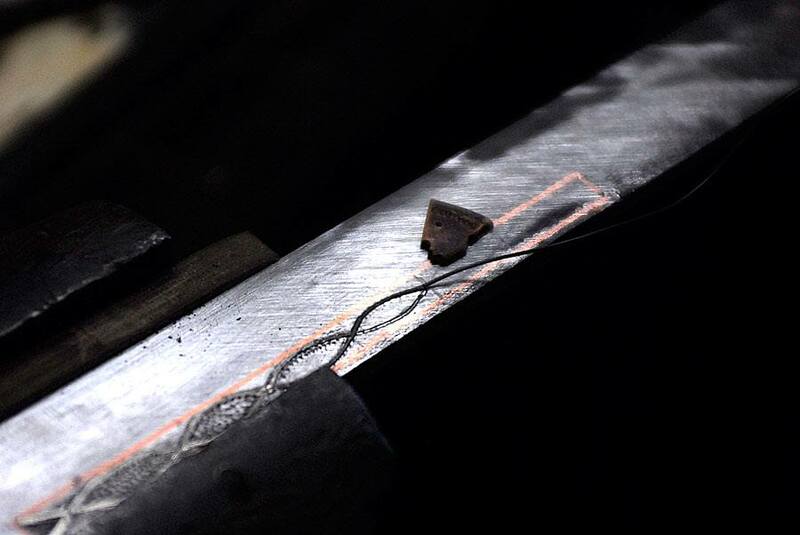 The overall profile of the blade is slim and yet strong. 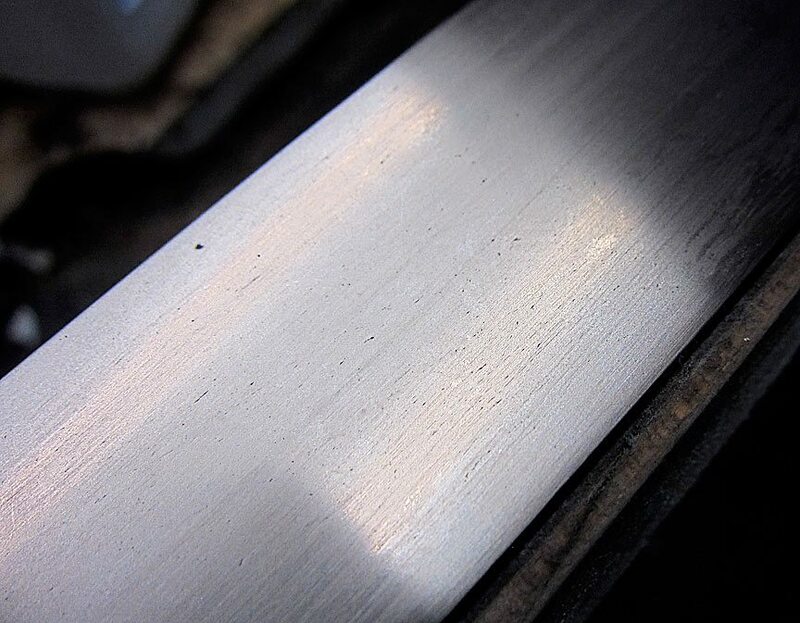 I'm getting to the part that's so difficult to explain about blades I love when I see them, but goddamn, the lines are right. Everything about this object screams of a past age to me, or at least a past age of my imagination. It grabs me by whatever piece of me wants to grab it, examine it from every angle, fall into it. There's another world in this piece, and Zeb and Scott and dragging it out.